Emperor penguins (Aptenodytes forsteri) are the largest type of penguin. 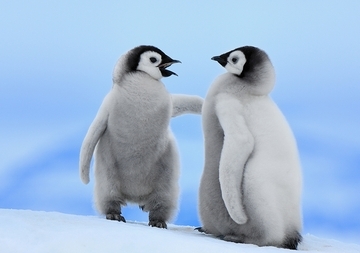 This pair of chicks, in Snow Hill Island, Antarctica, could grow up to stand nearly four feet tall. The chicks’ down feathers are not waterproof, so they must stay out of the water until they grow in their juvenile plumage at about one year of age. When they’re no longer protected by their parents, chicks will huddle with one another to stay warm.